Dean didn’t just delegate this product assortment to a corner of the studio, but rather developed a full-fledged store of specialty decorative painting supplies. Products run the gamut, including glazes, Japan paints, metallic paints, metallic powders, gold leaf, Venetian plasters, dead-flat and epoxy finishes, gels, waxes, crackles, professional-grade artists’ brushes, premium sea wool sponges, graining tools, stencils and even such hard-to-find items as authentic lime paint and milk paints. Among the brands the store sells are Adicolor, Briste, Golden Artist Colors, Modern Masters, Polyvine, Sepp, T.J. Ronan and TexSton. In 2003, Dundean Studios relocated a half-mile away from the studio site it had occupied since 1998. “We nearly tripled our size, from 1,700 square feet to 4,000, and then this year we added an additional 2,500 for a total of 6,500 square feet” Dean reports. Half of the area is devoted to retail/showroom and the rest is for teaching and studio work. Located in the commercial area of the small historic town of Chatham in Northern New Jersey, Dean acknowledges that the site is “a little bit off the beaten path.” But this fits into Dean’s scenario of attracting a purely professional clientele of interior designers and painters. “We’re not interested in attracting the DIY consumer because big box stores and TV shows have done such a fine job of selling them on ‘easy to learn’ finishes that we don’t want to waste time by trying to disabuse them of this notion. The fact is, most finishes require some degree of skill and training and most people do not want to hear that. They want a roller to roll out a mahogany grain or a spray-on venetian plaster”. In spite of Chatham being a small town, it is only 24 miles from Manhattan. So the market is huge. The expanded showroom enables Dean to showcase his own decorative painting skills. The surrounding walls are adorned with dozens of sample of faux wood, marble, ornamental, trompe l’oeil and other decorative finishes. Most of these finishes are taught in workshops in one of the two large classroom. The main classroom has two rolling walls, is well-lighted with natural light and has a kitchen where Dean makes sure the pot is always full of his custom-roasted coffee. The spacious new classroom is where the plaster, cement staining, Skimstone and other messy workshops take place. 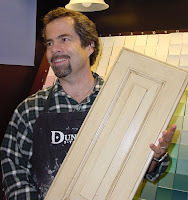 Just as he did before establishing the teaching side of his business, Dean continues to paint decorative finishes professionally. He divides his time between painting and teaching. In a career that has spanned three decades, he has done work from Beverly Hills, California to Fifth Avenue, New York, and does not see a time when he will put down his brushes. Among his major commissions are rooms in the Vizcaya Museum in Miami, the Craftsman House in Old Charleston, the Willow House in Morristown and the Thomas Edison estate in Llewellyn Park. One of his primary specialty areas is conservation and restoration work. Dean also has strong credentials in the teaching field. 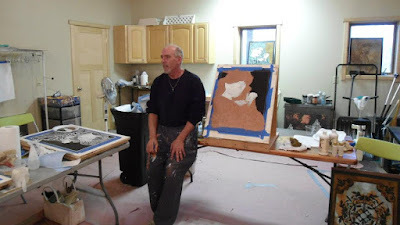 In addition to being the core instructor at Dundean Studios, he has taught art courses at his alma mater, the University of Toronto-Sheridan Art College, where he earned his bachelor’s of arts degree in art and art history. He regularly runs scenic design workshops for area high schools. He has also taught at the Isabel O’Neil Studio in New York and other prestigious venues. He is a member of the International Decorative Painters Salon, which has enabled him to network with some of the top artisans in the world. As a result of his connections, he has been able to invite top North American and European talents to teach guest workshops at his studio. Andrea joined Dean in the business in 1998, at the time the teaching studio opened, and then became the business’ full-time manager approximately five years ago. “After 24 years as a corporate banker, she decided that I was having entirely too much fun, so she decided to join me,” he says with a laugh. Even though they are extremely busy running their business, Dean and Andrea have taken a leadership role in bringing faux and specialty painters into the Painting and Decorating Contractors of America. They co-founded the Mid-Atlantic Faux and Decorative Artisans Chapter, which is the first specialty PDCA chapter in the country. Dean is currently president of the National Decorative Alliance Forum. In addition, Dean is on the NJ District PDCA Board.